Unfortunately my paddling buddy wasn’t feeling very well on Tuesday and decided not to paddle. This was a difficult decision for him as we had planned and discussed the trip to the Skerries the night before. But he said there was no point in him trying to paddle, only to have a problem whilst at sea and put us all in danger. Whilst I understood very well what he was saying, I still felt really gutted for him that he was not able to join us. 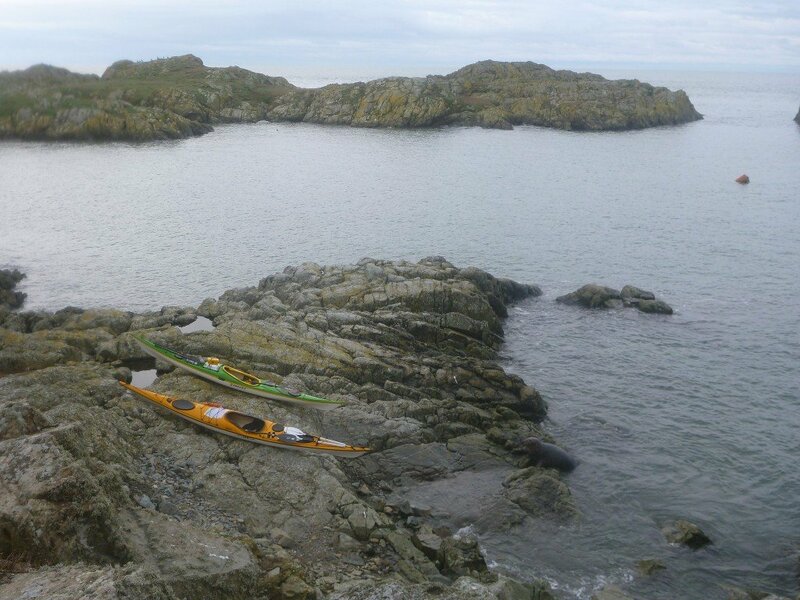 So having got ready in the car park at Church Bay and having said our goodbyes to my paddling buddy, as he set off home, Phil and I set off for the Skerries. Once again my stupid GoPro played up on me and I only managed to get pictures once we had stopped for lunch. 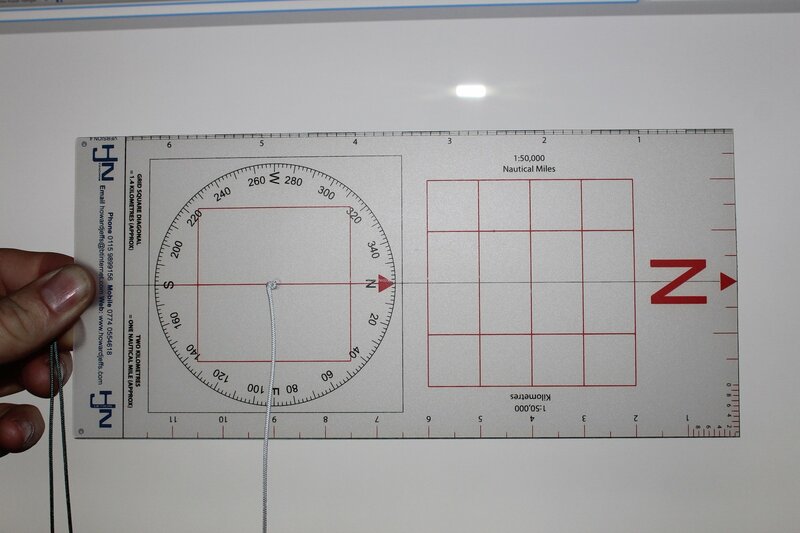 Our tidal planning told us that we needed to keep on a bearing of 288 in order to hit the Skerries. 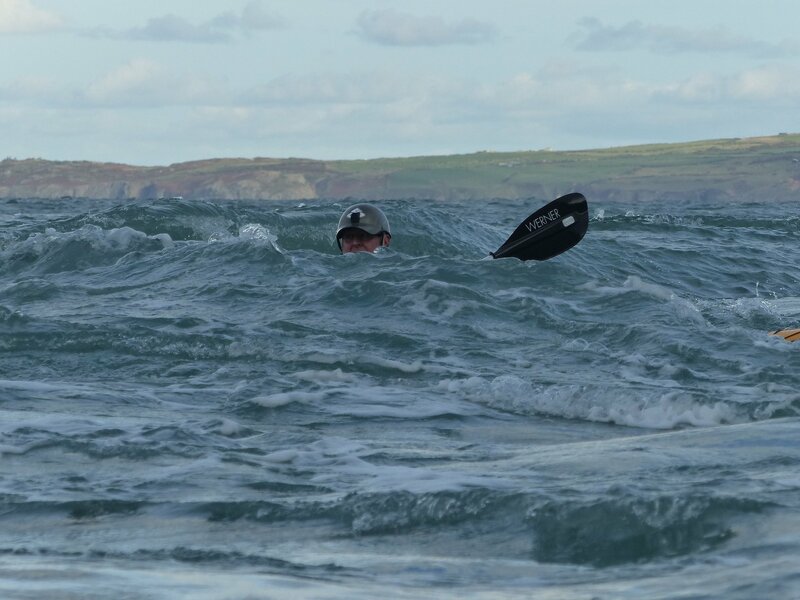 This has to be said felt very strange as we could see the Skerries off to our right, but we were paddling out to the horizon. 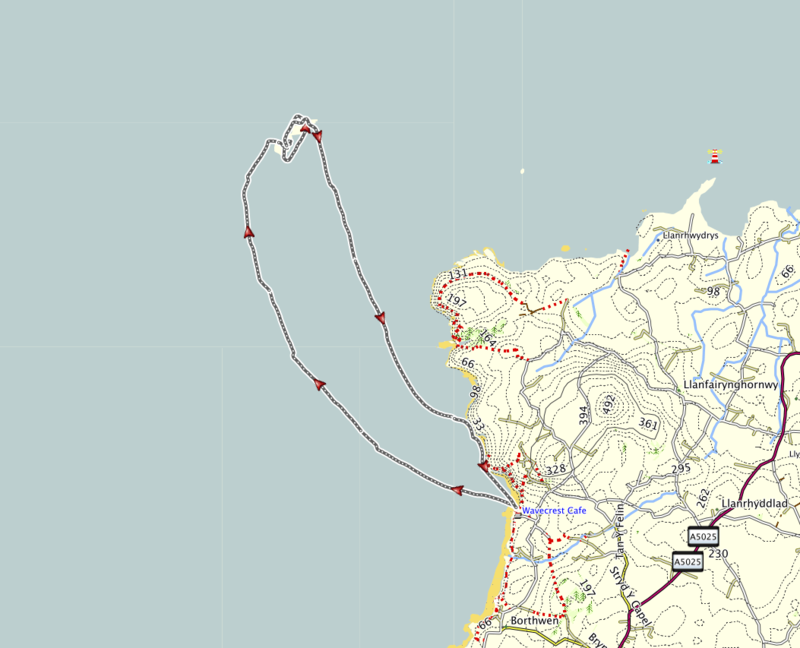 Of course the tide would, and did, pull us on a fairly efficient course to the islands. You can see the track we took on my GPS below. The slight kinks you can see in the GPS track are where we stopped every 20 minutes to check our position. 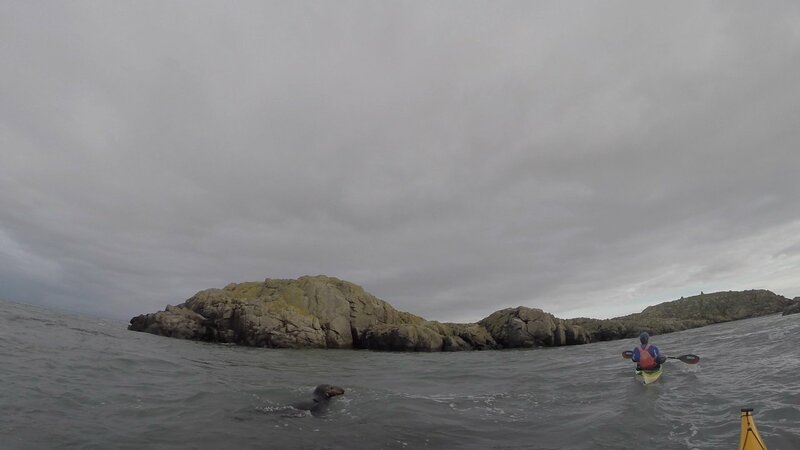 The Skerries are a group of sparsely vegetated rocky islets a couple of miles off from Carmel Head, at the northwest corner of Anglesey. 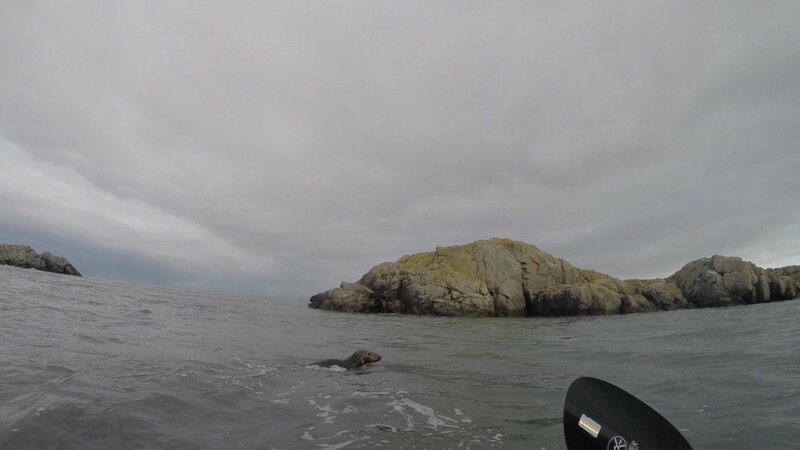 The Welsh name for these islands, Ynysoedd y Moelrhoniaid, means “the Islands of Bald-headed Grey Seals”. There are certainly plenty of seals to be seen. In the breeding season the islands become a seabird colony and is particularly important for Arctic Terns. The Skerries rocks on which the Lighthouse stands, lies directly in the path of many of the major shipping lines from Liverpool and Ireland. The lighthouse gives a guide to passing shipping and a warning of the dangerous rocks. 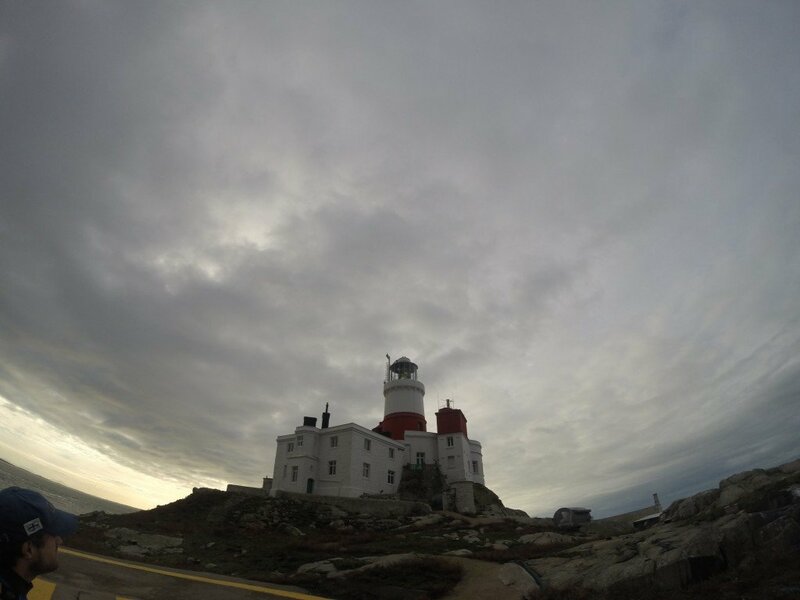 First established in 1717, It was purchased by Trinity House in 1841 for over £444,984, the last privately owned lighthouse in the British Isles to be bought by Trinity House. 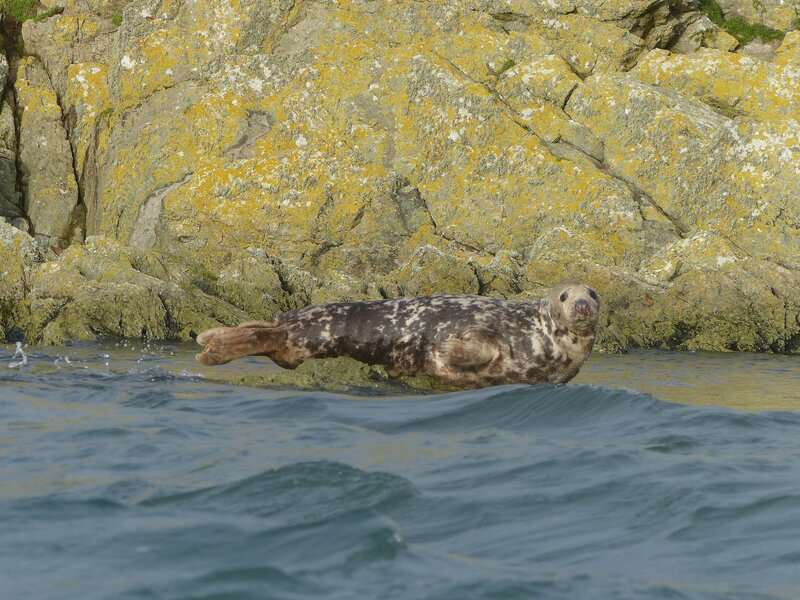 A grey seal trying not to get its flippers wet. 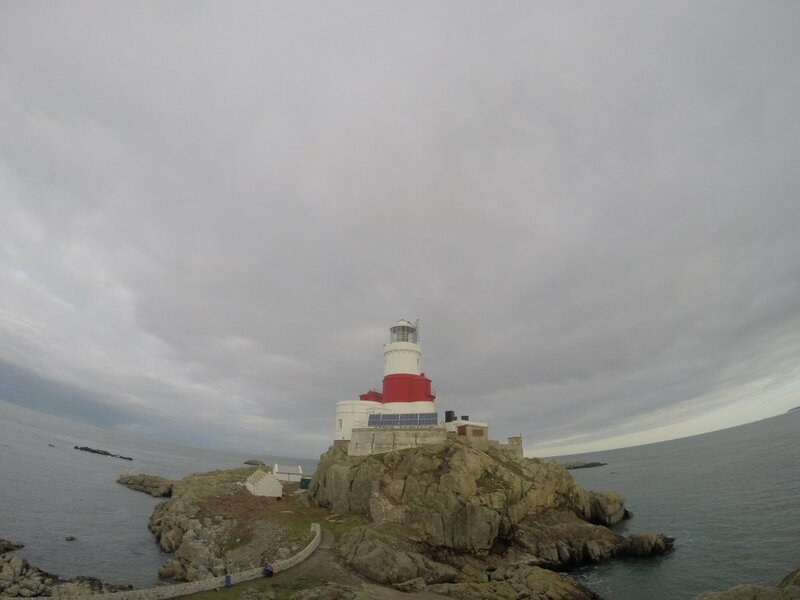 The Skerries Lighthouse eventually became a profitable private lighthouse with the right to levy dues from passing ships. 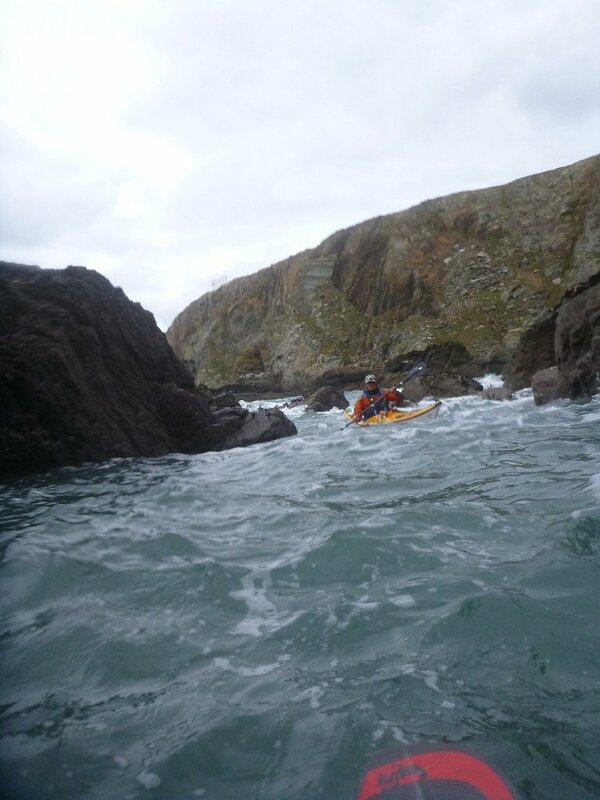 Having had our lunch, the tide had turned and it was time for us to set back to Church Bay. This time we didn’t bother with a bearing as hitting the mainland wouldn’t be so tricky. It is much easier to set a transit on the land. I am not sure if he was chasing us off! 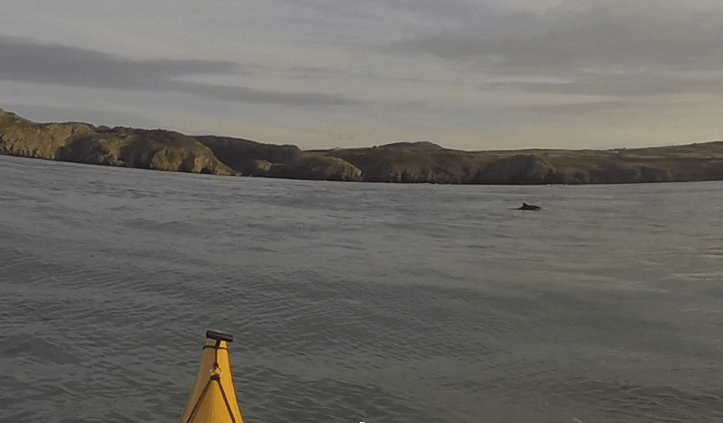 Porpoise on the return journey. One of the smallest marine mammals. On the return trip we passed though several sections of “funny” water. Sometimes we would cross a strong current, at other times the sea would be perfectly flat. 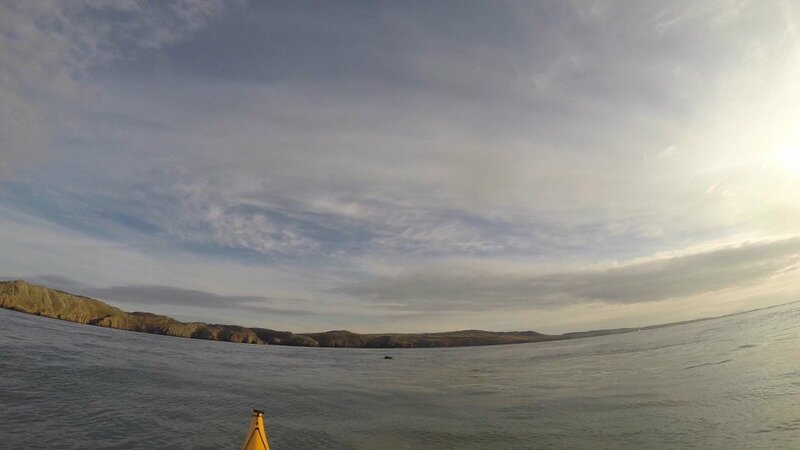 It was in one of the flat sections that the porpoises appeared briefly. We did a bit of rock-hoping on the return back to Church Bay. The section from Church bay to Carmel head is well worth another explore. Plenty of rock-hoping opportunities and caves to explore. I will be definitely be going back to the Skerries, hopefully in the spring when the birds are nesting. According to my GPS, we paddled about 12 miles. What a fantastic day out. Best days paddling ever! 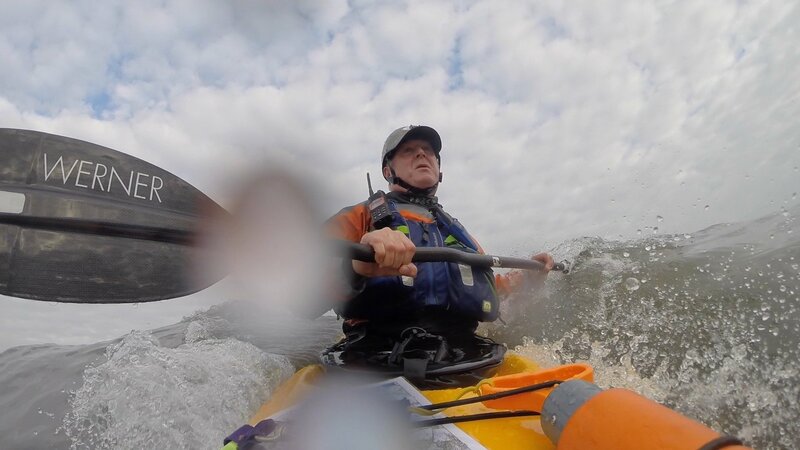 Many thanks to Phil Clegg of Sea Kayak Anglesey for the use of his pictures and two days worth of excellent coaching.